The City of Palo Alto in California is home to approximately 67,000 residents and provides single stream recycling collection to the whole community (e.g., single-family residents, multi-family complexes, and commercial businesses, schools). The City switched to single-stream recycling from a multiple sort program in 2005. The same year, the City extended their sustainability commitments and adopted a city-wide goal of Zero Waste by 2021. To help achieve this goal, Palo Alto started a curbside compost collection program in 2009 for commercial businesses and in the same year expanded the recycling collection program to accept plastics and plastic foodservice packaging. In 2015, the residential curbside compost collection was expanded to include food scraps, compostable plastics, and soiled paper. The program has been seeing increasing quantities in both streams. The City’s diversion rate has risen from 63% in 2007 to 82% in 2016. Palo Alto strives to educate its community on how to prepare recyclables and which materials to include in each bin. Residents and businesses sometimes don’t realize that recyclable containers need to be free of food and liquids before being placed in a recycling bin. Food and liquids left in containers is a source of contamination and will affect other materials. Some people are also hesitant about putting soiled paper and pizza boxes into their compost bins. 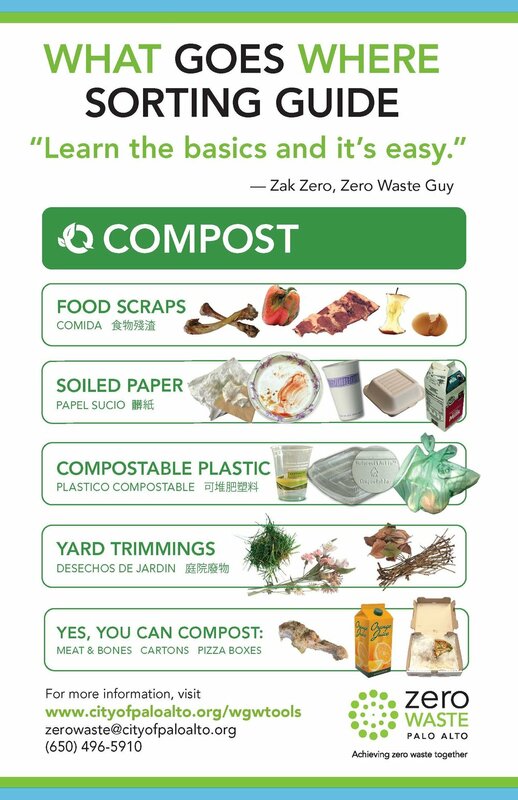 Palo Alto is tackling these issues by providing the community with outreach including detailed material guides, posters, utility bill inserts, how-to videos and customizable compost and recycling signs that customers can print out. Palo Alto’s recyclable and compostable materials are handled by various facilities in the same family of companies. The City’s recyclables, including foodservice packaging, are taken to the GreenWaste Material Recovery Facility in San Jose, where the recyclables are processed and shipped to paper mills, reprocessors, and various other markets. All the compostable foodservice packaging collected through Palo Alto’s compost program is transported to Zero Waste Energy Development Company’s Anaerobic Digestion Facility in San Jose, where the materials first pass through a dry-fermentation anaerobic digestion process that generates energy utilized onsite and at neighboring facilities. The digestate then undergoes composting, and the finished compost is sold to local markets for landscaping. An important message for cities considering adding foodservice packaging to diversion programs is to educate the public on how food and moisture can contaminate clean recyclables. Encourage residents and businesses to recycle and compost correctly by explaining how contamination and “wishcycling” (trying to recycle items that are non-recyclable) can hurt collective efforts to improve material diversion. It’s also important to ensure that residents and businesses are equipped with everything they need to sort and prepare their items for collection – the City’s contracted hauler distributes tools such as quarterly newsletters, kitchen compost buckets and even box cutters for breaking down cardboard boxes. Pairing broad outreach with the right waste sorting setup ensures customers have the knowledge and the tools to recycle and compost correctly. This contributes to cleaner streams, higher diversion, decreased greenhouse gases, and for the City of Palo Alto, a step towards their zero waste goals.